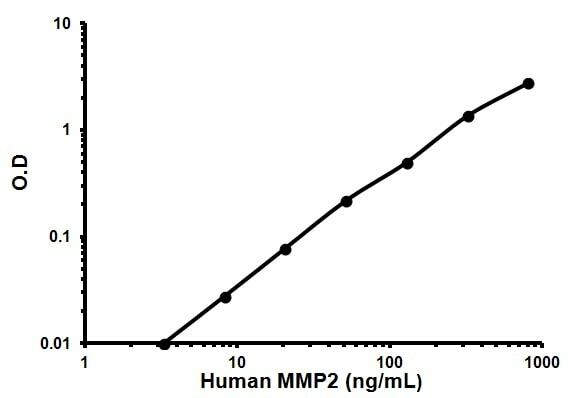 Abcam’s Human MMP2 ELISA (Enzyme-Linked Immunosorbent Assay) kit is an in vitro enzyme-linked immunosorbent assay for the quantitative measurement of Human MMP2 in serum, plasma, and cell culture supernates. (Collect plasma using heparin as an anticoagulant. EDTA and Citrate are not recommended as anticoagulants for use in this assay due to their chelating properties). 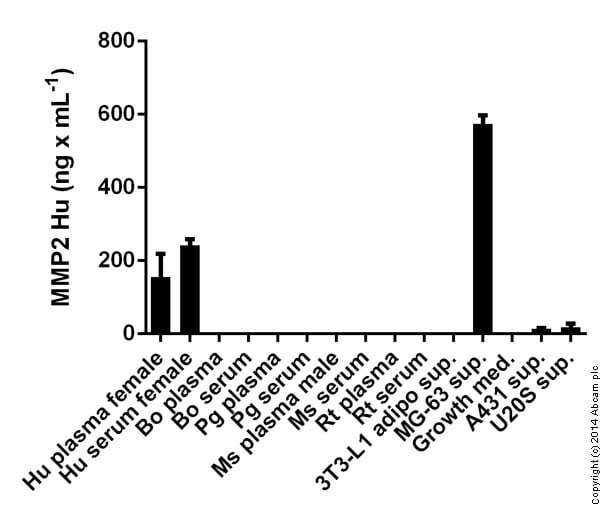 This assay employs an antibody specific for Human MMP2 coated on a 96-well plate. Standards and samples are pipetted into the wells and MMP2 present in a sample is bound to the wells by the immobilized antibody. The wells are washed and biotinylated anti-Human MMP2 antibody is added. After washing away unbound biotinylated antibody, HRP-conjugated streptavidin is pipetted to the wells. The wells are again washed, a TMB substrate solution is added to the wells and color develops in proportion to the amount of MMP2 bound. The Stop Solution changes the color from blue to yellow, and the intensity of the color is measured at 450 nm. Optimisation may be required with urine samples. Our Abpromise guarantee covers the use of ab100606 in the following tested applications. Representative Standard Curve using ab100606. Publishing research using ab100606? Please let us know so that we can cite the reference in this datasheet. We are interested in your MMP ELISAs and would like to know if products # ab100606 and # ab100608 recognize both the pro-form (zymogen) and the active enzyme or just one of them? I can confirm that kits ab100606 and ab100608 recognizes both pro and mature forms of respective proteins. This kit was very easy to use. I followed the product insert exactly and it worked very well. The results were also reproducible. I would use abcam again for my ELISA or western blotting needs. Hope this e-mail finds you well! Looking forward towards your valued response on it. I can confirm that these two kits have not been experimentally tested with human cerebrospinal fluid and are therefore not guaranteed to work with this kind of sample. But we are confident that ab100606 and ab100610 should work with human cerebrospinal fluid. This has to be determined by the customer along with the optimal dilution for human cerebrospinal fluid samples. I ma sorry that I could not provide you with a more detailed answer on this occasion and wish your customer and you an good start into the new week. Is any of the following kits specific for the C-terminal of MMP2? Could you please provide further information regarding the kit's specificity? The exact epitopes which these antibodies recognise has not been determined and I can therefore not say if they detect the C-terminal or N-terminal part of the protein. I am sorry that I could not be of more help. If you have any further questions, please do not hesitate to contact us again. Please check the below and reply me. Our customer would like to order as soon as possible. Please note this product is unpublished so when you decide to order you need to contact our customer service team for them to put this item in your order. I hope this info will help. Please let me know if you experience any difficulties. Thank you for your quick reply and offer to send us a replacement kit for MMP2. As far as we can judge from the standards looking ok the other kits were not affected but it is difficult to predict whether there was any effect of the buffer as this is the first time we have done these ELISAs on our samples so we have nothing to compare it to. The other kits had less of the white substance in their buffers and were more sensitive assays and so I guess they may not be as susceptible to interference effects as the MMP2 kit which has a sensitivity 100x less than the other 3 kits. I am not sure we need extra clear buffer as we have used up all the wells in the ELISA kits. The issue is going to be that we now need to do some more samples for TIMP1 and MMP9 and we are concerned about the reproducibility between kits / consistency between kits relating to this buffer, i.e. difference between our last kits and any new ones we buy which hopefully will not have the white gloopy substance and thus the buffer composition may be different. I am currently having discussions with developer of this kit regarding the new kit we agreed, sending as a free of charge replacement. This is an extra step for avoiding any further inconvenience due to white precipitates. I will contact you again at the latest tomorrow morning with more updates. Many thanks for having patience! Our customer purchased 6 different kits and those HRP-streptavidin concentrations are vary. Let me know the concentration of this new product and if this is available from now. Our customer concerns about the concentration because she has to change the protocol byherself. This product is available but not published on our website. You cannot purchase this using our normal ordering system however I can add this product to your next shipment. Could you confirm how many vials customer would need..6?. In my last I made an error in calculating the price; the price would be $720 for 6 vials. The concentration of HRP-streptavidin is not important. The 200ul solution could be used as recommended in protocol. Please note customer have to use new protocol with these new vials, which is available on our website. Each kit protocol have the information on how to use the 200ul vial of HRP-Strep conjugate. Our customer is looking forward to your reply. Thank you for contacting us. I apologize for the delay. We are ready to publish this product. The product would be available at US dollar 120 per 200ul. The customer would need 6 vials of product so it will cost them $720 excluding shipping charges. Could you please let us know if customer would like to purchase the product? She stored them 4 degrees for 6 months and transferred only standards to -80C. And this morning she opened them to use but found out all the 'HRP-Streptavidin Concentrate vials empty. She would like to know ifshe can use those kits now and purchase HRP-streptavidin concentrate only. But I checked those have different concentrated form, 400x, 300x, 500x or 440x,. Please let me know how our customer can use those kits. Thank you for your email. I am sorry for the delay while I was in contact with lab. HRP-Streptavidin – comes as a liquid concentrate. Before withdrawing any liquid from the tube, be sure to centrifuge the vial and pipette up and down to mix thoroughly, as precipitation may form in storage. Once diluted, the HRP-strep must be used up that day. Do not store. I am also in contact with lab regarding the diluents need to be used for diluting the HRP-Streptavidin vial. I will get back to you with the information soon. Please note, the expiration date of kit is 6 month from date of purchase including HRP-Streptavidin. Once the HRP streptavidin is reconstituted it should be used same day. Finally, I can suggest using one kit with the provided HRP-Streptavidin, If in case it does not work then you may buy HRP- streptavidin separately. I will confirm the price if you are interested in buying this. I hope this information will be helpful. I will contact you with more information soon. Could you let me know if you could provide me with any pricing discount based on my multiple purchases (I am likely to need more in future). I am based at the University of Surrey. Thank you very much for contacting. I apologize for the delay as we were conducting some tests. We have also seen gloopy things in the Assay buffer which first seen as like fungal growth however when we warmed the buffer at room temperature which is the working temperature of buffer; the precipitates were vanished. Because the assay diluent contains some proteins and solutes so it would not be uncommon to see cloudiness or floating unsolubilized protein aggregates (especially after storing at low temperatures and/or for a long period of time). We recommend bringing the solution up to room temperature, mixing it thoroughly and diluting to the 1X working concentration which will help clarifying the solution and solubilising any protein aggregates or precipitates. Centrifuging and filtering can also help. I hope this informaiton will be helpful. Should you have any further question or if these kits does not work properly please do not hesitate to contact me.